After all the axis of the machine have been homed as per the homing sequence the tool changer logic will home the tool changer. The tools will be retracted and the system will wait for as per the timeout period setup in the Umbrella Toll Changer Settings. Once retraced the tools will rotate until the homing sensor on the tools is not activated. IMPORTANT: The home position of the tool changer must be marked as Tool ‘0’. Then the system will automatically rotate the tool to the last loaded position (empty tool slot). Spindle is turned OFF and system waits for the spindle to stop as per the spindle “Spin down delay” value in the spindle settings. System checks if the current tool in the spindle is setup in a slot is the F4-Tools screen, else gives an error. System checks if the tool to load is setup in a slot is the F4-Tools screen, else gives an error. Z Axis moves UP to the Tool Pick & Place Z position. “Tool Changer – Output 3” goes HIGH to move Tools In Position to unload the current tool. The system waits for time setup in Timeout settings for the “Tool Changer – Input 4” (Tools In Position) signal to go HIGH, else gives an error. “Chuck Clamp M10/M11″ goes HIGH to unclamp the tool. Z Axis moves up to the Tool holder Z clearance position. “Tool Changer – Output 1” goes HIGH to Rotate Tools and counts pulses from“Tool Changer – Input 2”. Once the desired tool is in position the “Tool Changer – Output 1” goes LOW to stop tool rotation. Z Axis moves DOWN to the Tool Pick & Place Z position. “Chuck Clamp M10/M11″ goes LOW to clamp the tool. 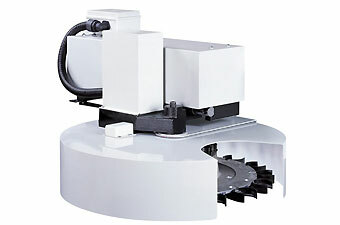 “Tool Changer – Output 2” goes HIGH to move Retract the tools away from the spindle. The system waits for time setup in Timeout settings for the “Tool Changer – Input 3” (Tools In Position) signal to go HIGH, else gives an error.